Continuing the Obama adminstration’s support for manufacturing in the USA, Tom Kalil, the Deputy Director for Technology and Innovation at the White House Office of Science and Technology Policy, and Jason Miller, the Deputy Director of the National Economic Council, announced the first ever White House Maker Faire. The White House will be bringing makers together in Washington, D.C. on June 18 to show the wealth of innovations they have created in Makerspaces, Fab Labs, or even their garages. 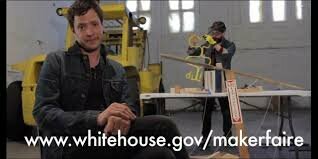 To get to the younger set, the administration tapped the band OK Go for the announcement. Desktop 3D Printers such as the Makerbot and Cube have opened up the Maker Movement to ever more fantastic projects. Many programs that are based on projects such as Robotics are using 3D Printing to expedite turning designs into tangible things and to create parts that could never be made by traditional manufacturing. 3D Printing is also one of the processes incorporated into the suite of tools found in Fab Labs worldwide. Soon the White House will announce the list of participants but we’re confident there will be plenty of 3D Printing demonstrated at the event! Beyond the festivities at the White House, the administration is encouraging Makers throughout the country to celebrate their craft together on June 18 as a National Day of Making. There are suggestions for local activities on the White House official announcement page. These include posting about one of your projects on a maker website such as Make or Thingiverse. Follow Twitter Hashtag #NationOfMakers to keep abreast of all the activities from the innovative, creative visionaries who make. It’s bound to be fun and creative, as well as informative!